Did the medical professional who treated you make a mistake? Did negligence lead to that mistake? Have you been seriously injured as a result of that negligence? Medical mistakes are the third-leading cause of death in the United States, trailing only heart disease and cancer. Medical malpractice cases are complex, costly, and incredibly time-consuming. Because the evidence required to prove malpractice is complicated by nature, you are going to need the testimony of both legal and medical experts. Burg Simpson’s experienced medical malpractice attorneys have assembled a professional team of medical injury lawyers in Denver to review the facts of your medical malpractice case. Contact Burg Simpson as soon as possible by filling out our convenient FREE Case Evaluation form, or call us right away at 720-644-0900, to find out how we can help you now. You suffered damages significant to justify the costs and time associated with litigation, and for which a jury can compensate you. If you believe that you were injured as a result of a healthcare provider’s negligence, please call our medical injury lawyers to discuss your legal matter. We are here to help, and there is no charge for an initial consultation. WHAT IS YOUR MEDICAL MALPRACTICE CASE WORTH? The nature and extent of the injury and the treatment received. The extent of liability of each party involved. The potential economic loss the victim suffered. Future medical needs and expenses. The types of damages that can be recovered include economic, non-economic and sometimes even punitive damages. HOW LONG DO I HAVE TO FILE A MEDICAL MALPRACTICE SUIT? The Discovery Rule allows the statute of limitations to be extended if the victim could not have reasonably learned sooner that he or she had a medical malpractice case. In Colorado, the clock doesn’t begin ticking until malpractice the victim knows, or should have known, that he or she was injured and that medical malpractice led to the injury. Statute of Limitations for Minor Children– There are two different statutes of limitations deadlines in Colorado that apply to the parents or legal guardians of children under the age of eighteen. For any additional questions, reach out to our medical injury lawyers. The first statute of limitations applies to minor children under the age of eight years, who were under six years of age on the date of the alleged malpractice. A medical malpractice lawsuit can be filed at any time prior to the child’s eighth birthday. The second statute of limitation applies to minor children between the ages of eight and eighteen. For children between eight and eighteen, if a legal representative is appointed for them at any time after the alleged malpractice and before they turn eighteen, the child will be allowed two years from the date of the legal representative’s appointment to file a lawsuit. The Statute of Repose – An absolute Deadline – A statute of repose enforces an absolute deadline to medical malpractice claims. The deadline does not take into account when the victim discovered the injury. In the State of Colorado, the statute of repose is 3 years, but with several exceptions. If you believe that you, or a loved one, has been the victim of medical malpractice, it is important to call an attorney as soon as possible. 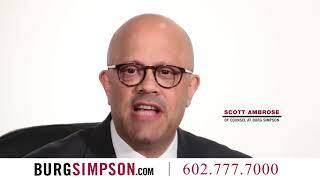 Call the Denver medical malpractice attorneys at Burg Simpson to discuss your rights and options. WHAT EXPERTS ARE NEEDED FOR YOUR MEDICAL MALPRACTICE CASE – AND WHY? If you have been injured by a medical professional, such as a doctor or nurse, your medical injury lawyers will use experts to explain to the jury exactly what happened and how the medical professional’s conduct caused your injury. To legally prove a medical malpractice case, your attorney must demonstrate to the court that the physician made a treatment decision that no reasonable physician would have made under the same or similar circumstances. That unreasonable action is called a “breach of the standard of care.” Your legal team must show how the violation caused your injury and explain how much your case is worth. Medical malpractice attorneys and experts are needed for all of these elements. As a rule, the professional you are suing can only be scrutinized by an expert in the same field with the same credentials. If the defendant is a physician who is board-certified in general surgery, then the expert retained to evaluate his care also must generally be a board-certified general surgeon. Speak with a medical malpractice lawyer at Burg Simpson today by filling out a FREE Case Evaluation form, or call us directly at 720-644-0900, to learn how our Denver medical injury lawyers can provide you with the support and guidance you need. Additional medical malpractice attorneys are typically needed to discuss how the defendant’s actions caused the plaintiff’s injury. Consider the example of the defendant who is a family doctor who prescribed the wrong medication to a patient. The patient experienced an adverse reaction to the medication and suffered a stroke. In that case, the plaintiff will need a family doctor with similar credentials as the defendant to explain why the prescription was wrong. The plaintiff might also need to hire a neurologist to explain the stroke and a pharmacologist to explain the mechanism underlying how the medication caused the stroke. The plaintiff may even need other specialists to explain other aspects of the causal link between the doctor’s mistake and the injury it caused. In medical malpractice matters, it is not unusual for a plaintiff to require multiple experts to cover various issues regarding the case. One of the primary goals of a medical negligence lawsuit is to obtain compensation that will cover future medical care for the plaintiff. Although our medical malpractice attorneys can put a price on economic damages such as medical expenses, loss of wages, and the loss of the ability to work, plaintiffs with a permanent injury will also require future medical care. An expert called a life care planner will calculate the cost of providing the medical care and treatment the plaintiff will need going forward. An economist is also needed to calculate the value of past and future medical bills and lost wages. The economist takes the life care plan and calculates its net value – including inflation and interest. The life care planner and the economist work together to create a picture of how much the plaintiff’s claim is worth, in current dollars. However, it is important to note that neither of these experts adds any compensation for the plaintiff’s pain and suffering. 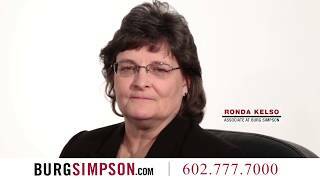 Burg Simpson’s Denver medical injury lawyers are well equipped to help you through this complicated process. Call us today at 720-644-0900. WHAT DOES SUBROGATION HAVE TO DO WITH MEDICAL MALPRACTICE? If negligent medical care has left you seriously injured, reach out to one of our medical malpractice attorneys. A successful lawsuit will almost always lead to a “subrogation interest” or “subrogation lien.” If you have health insurance, either through a private company or a federal program, a subrogation lien is typically a certainty. Therefore, as a medical malpractice plaintiff, you need to understand what this means and how it can affect your claim. Different lawyers handle these issues in different ways. Sometimes your medical malpractice attorney will hire another lawyer to handle these liens, and other times your lawyer can handle them. Make sure you ask your lawyer what their practice is, and whether you will be charged additional fees or costs. Health insurance providers are identified from the information you provide, as well as from your medical records. Every insurer who paid any claims or is listed anywhere in your files will be contacted and notified of pending litigation involving you, their insured. Each insurer is asked to provide a list of all paid claims related to your injuries. Periodically throughout the course of litigation, your insurers may provide updated listings of paid claims. When the case is nearing resolution, the amount of your liens is considered as part of the settlement, so that you can make a better decision about whether any potential settlement offer will be satisfactory. Your medical injury lawyer will then review the itemized list of paid claims and notify the insurer which claims were related to the injury that gave rise to your lawsuit. Based on that information, the amount you have to pay back to the insurer after your settlement may be adjusted to deduct the claims not caused by malpractice. Additional discounts may then be negotiated. Your attorney should ask the lien holder to discount the lien amount based on the fact that you had to pay attorneys’ fees to get your settlement. Once a final lien amount is reached, reflecting all discounts and adjustments that can be obtained for you, it must be paid from your settlement proceeds BEFORE FUNDS ARE DISBURSED TO YOU. You may be able to receive some of your settlement money, but the lawyers will be required to hold back enough money to pay the liens and keep that money in a trust until the liens are resolved. Only then will they be able to refund/disburse back to you any amount not needed to pay liens because of discounts. Because you cannot obtain your settlement proceeds until your liens have been satisfied, it is important to know that your medical malpractice lawyers have a handle on what to do and how to get your liens resolved quickly. 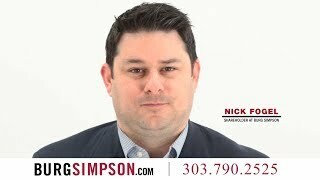 Call our Denver medical injury lawyers at Burg Simpson if you have been injured. It is imperative to start your case as soon as possible after the personal injury occurred, so contact us at 720-644-0900 for your free consultation.